Clearly, you’ll have to carry out some of the previous tasks yourself, since no one would do them better than you. But I’m sure that doing some of the others yourself is not the most efficient procedure, nor will it bring any value to you. So, do you know how much time you’re devoting to each of them? On average, according to the statistics on B2C content marketing trends in 2016, 32% of the budget dedicated to B2C business marketing goes to content marketing. 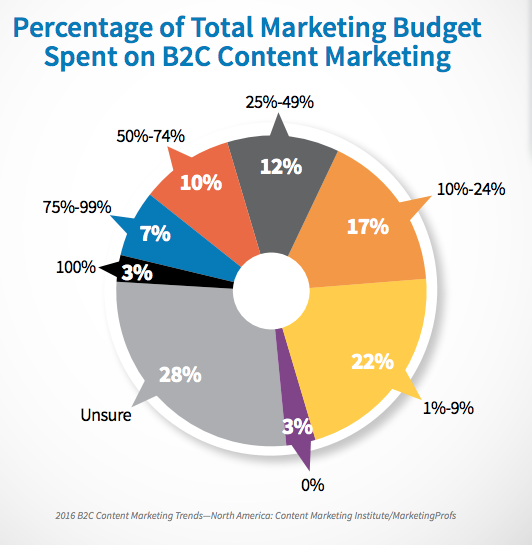 Percentage of total marketing budget dedicated to B2C content marketing (Source: Content Marketing Institute). As you can see in the graph above, the marketing resources of 3% of companies are allocated exclusively to content marketing. In fact, for over 20% of businesses, half of the marketing budget is spent on content marketing. This report shows that the percentage of marketing budget dedicated to content marketing is not negligible. So if your content marketing is so important, being efficient in this area will save a lot of money. The question you should be asking yourself is the following: of all the tasks mentioned above, what percentage of your time do you invest in each of them? When you look for information about what it normally takes to write a post, the amount of time can vary considerably, as John McDougall comments. It’s not the same to write a 500-word post, which explains a personal experience and might take little more than half an hour, than creating a complex tutorial of more than 3,000 words with extensive research behind and covering more detailed topics. This could easily take you a day of work or even longer. 1 hour: reviewing and designing the article, (maybe translating it?). 23% of the time for promotion, impact analysis and re-promotion (tasks 7-10). 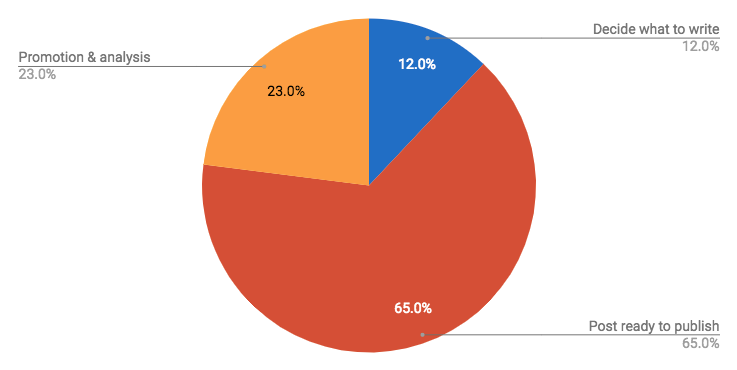 Distribution of the time that a blogger can devote to a post. Of the previous tasks, some of them are more susceptible to automation than others. In particular, promotion in social networks is one of them. Once you’ve finished writing your wonderful post, one of the most effective ways to increase its visibility is to promote it on social networks. So I recommend you take the time to write the messages on your social profiles (LinkedIn, Twitter, Facebook, Google+, Instagram, or Pinterest) and promote your post on each social network. Promote your posts on social media to increase your internet presence. One option is to go to each network and write there the promotion message that will launch your blog post to stardom. Another alternative is to use an external tool in which you can plan the messages that you want to publish on each social network. But if you really want to be efficient and save time, the best alternative is to promote your blog posts with Nelio Content, the WordPress plugin that helps you in content marketing. What advantages does it have? The most important one is that you no longer have to waste time entering each of the social networks to create the social message of promotion. So how does it work? Social Profiles in Nelio Content. 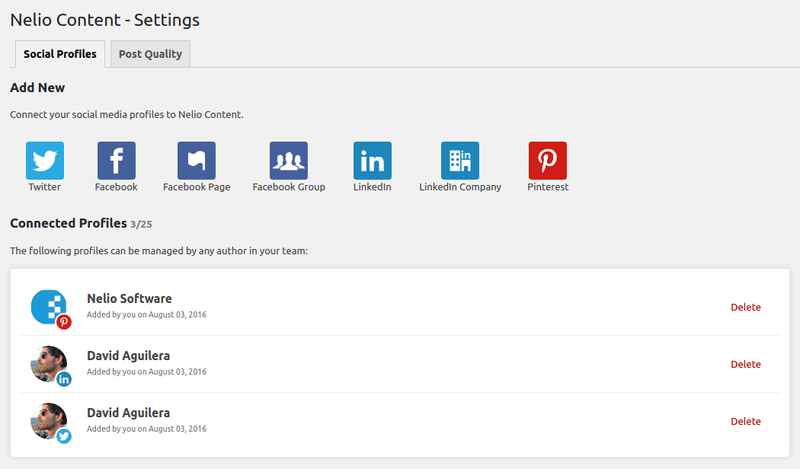 You can connect your social account to Nelio Content and share your content on those directly from WordPress. This way you can connect all the social profiles you want to share your post with. Then, as you write a post, you can plan all the social messages with a single click. Select the fragment of the text that you want to share and click the Share Selection button. Select the fragment you want to share and Share Selection, indicate when and in which social profiles you want that fragment to be shared. Don’t hesitate to modify the text to customize it if you want to. Create a social message of the selected fragment in the profiles you want and indicate when you want it to be published. After saving the message you can see it in the Social Media box, which shows all the messages programmed to promote the post you’re writing. In the Social Media box, you can see the messages scheduled for the day of the post’s publication, the following day, or any other day in the future. As you can see, this process of creating messages saves you a lot of time, since they’re part of the post’s own writing. Of course, at any time you can add any social message you want, which don’t have to be phrases extracted from the post itself. They can have the content you want. For the large majority of blogs (except maybe news blogs), a high percentage of visits come from previous posts. In fact, HubSpot says that 75% of blog visits and 90% of leads come from old posts. (Source: Marketing Statistics). This is why it’s so important that you take some time to analyze what posts are the most successful and re-promote them on your social networks. But how much time should I spend looking at Google Analytics and re-creating messages on social networks? Don’t worry, with Nelio Content it’s very simple. We don’t seek to compete with Google, we simply give you the information that may be most useful to easily re-promote your posts. Social Media analytics with Nelio Content show you the posts that have received the most visits and with a click on Add Message you can quickly create a new message to re-promote the posts in social networks. See? Now, this whole process is much simpler. And it doesn’t end here. You can still be much more efficient. 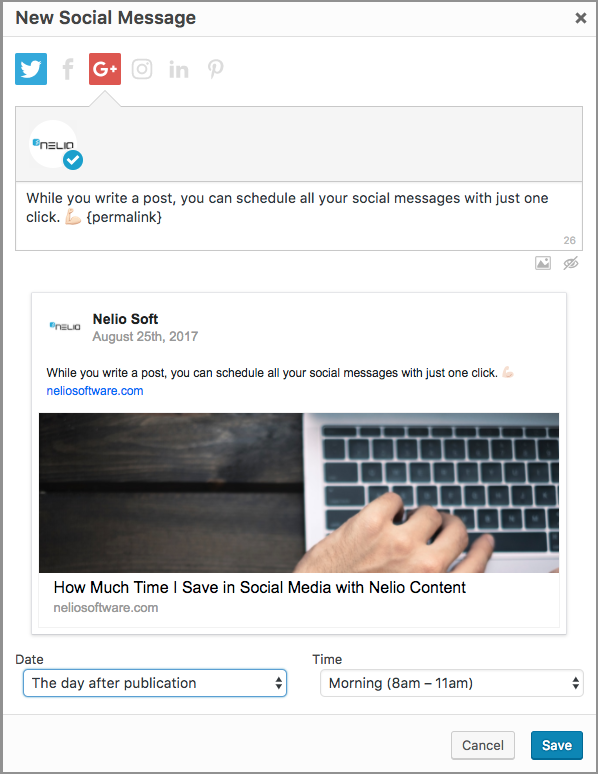 If your time is gold and you want to minimize the time you spend promoting or re-promoting your content on social media, you can add the Social Automations extension to Nelio Content. This way you won’t have to worry about manually creating social messages. Social Automations is an extension that processes the content you write and generates all the social messages necessary to reach a wider audience and maximize the impact of your posts on all your social networks. 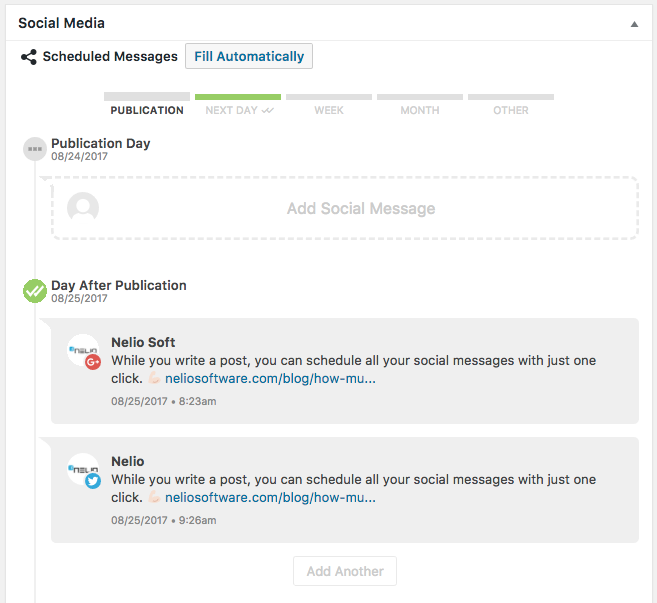 After writing a post, simply click on the button Create Social Messages Automatically and Nelio Content will fill the message queue for you. In addition, you won’t need to analyze the impact of your posts in social networks, as Social Automations automatically shares your best old posts in social networks to ensure that there’s a constant drip of information about your blog on them. The message generation algorithm decides what to share based on the traffic that a post attracts and the age of the post. You can also indicate which posts you don’t want to be promoted again under any circumstances. This way, you make sure that your social networking activity never dies. If the percentage of time devoted to promotion, impact analysis, and re-promotion of content is almost 25% of what you spend on content marketing, it’s time to look for ways to reduce it to the minimum expression. Don’t take the time to copy and paste text and images that you’ve already written, which is not giving you any value. Don’t go crazy looking at analytics when the only thing you really want is to re-promote the posts that work best and make sure your social networks are kept active. Let Nelio Content do the work for you! 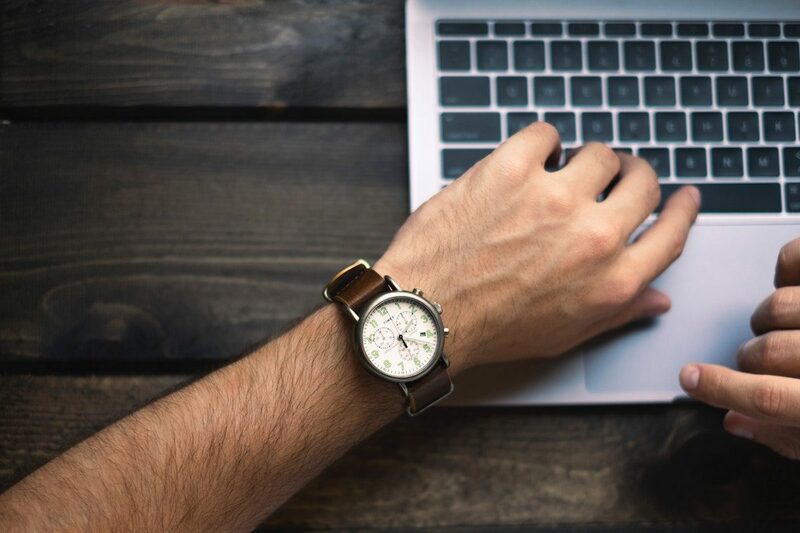 Following the example in which I guessed that you spend about two hours promoting each post of your blog, Nelio Content reduces this time of promotion drastically to less than 5 minutes (which is what it takes to review the social messages generated automatically). 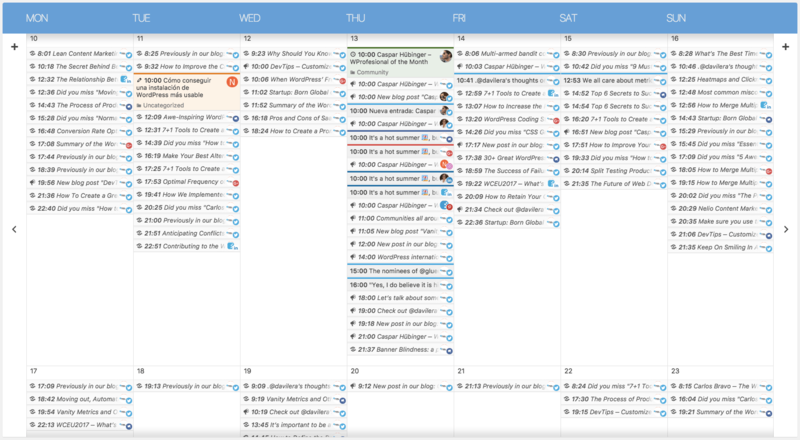 So note that if you write 2 posts a week, Nelio Content saves you about 15 hours a month. What do you think about gaining a whole weekend every month? These savings gives you an extra month of vacation per year 😉. Finally, I want to point out that in this post I have focused exclusively on the time saved in promoting content. But Nelio Content also makes it easier for you to create your editorial calendar and write content more efficiently, ensuring more quality. So you know: if you want to invest your time in what gives you value, use the tool that makes your life easier. Are you still thinking about it?